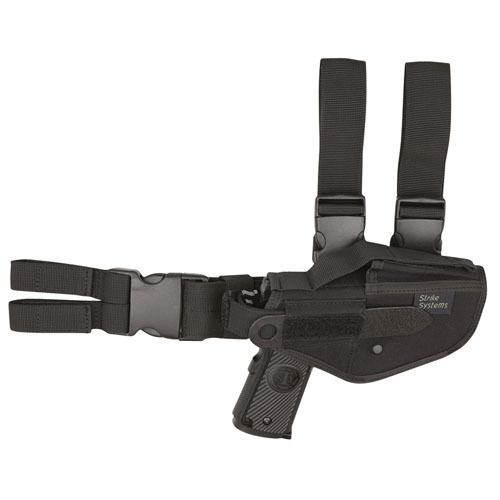 A fully adjustable thigh holster, with mag pouch. The rigid height adjustable strap with side release buckle, lets you place the holster exactly in the ideal position, for a fast draw. Double retention strap keeps the gun securely in the holster during the most rigorous activities. The side release buckles lets you take it on or off quickly. Heavy-duty, abrasion and water resistant nylon exterior construction. Double leg straps with elastic and side release buckles. Adjustable double security strap for safe weapon retention. Retention adjustment tool included. Durable nylon webbing with low profile side-release buckles. Double stitching for extra strength and durability. Color: Black. Fits M92, G17/18, STI, CZ, STEYR and Bersa. Also available in OD Green, Tan and Black.